Prepare all the greens, wash well and drain. Finely chop the stems and roughly shred all the leaves, leaving the watercress whole. Mash the garlic cloves and salt together. Heat the olive oil and melt the butter in a large sauté pan or deep pot. Add the shallots and garlic and cook over a low heat for 3 minutes. Stir in the chopped stems. Cook for 5 minutes. Increase the heat and, working in batches, add the spinach and remaining leaves. Cook for 4-5 minutes. Add plenty of freshly ground black pepper and the tarragon. Cook for 4-5 minutes until just wilted, and the majority of the liquid has evaporated. Transfer to a large serving bowl. Dress with an extra drizzle of olive oil and lemon juice to serve. 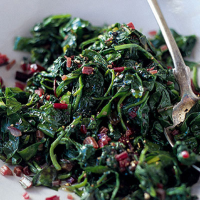 Replace the Swiss chard with an extra 2-2½ x 100g packs Wild Rocket and Chard Salad.